cravings, balance hormones, fight cancer and promote weight loss. So here, my way to add this healthiest food, i.e. flax seeds in our diet by making flax seeds chutney or जवसाची चटणी. It tastes amazing by mixing with oil to flax seeds chutney and when served with Bajra or jowar roti, chapati. Do try.! Total Time : 5 Minutes. Dry roast flax seeds for a minute on a hot pan. Remove it into another bowl. 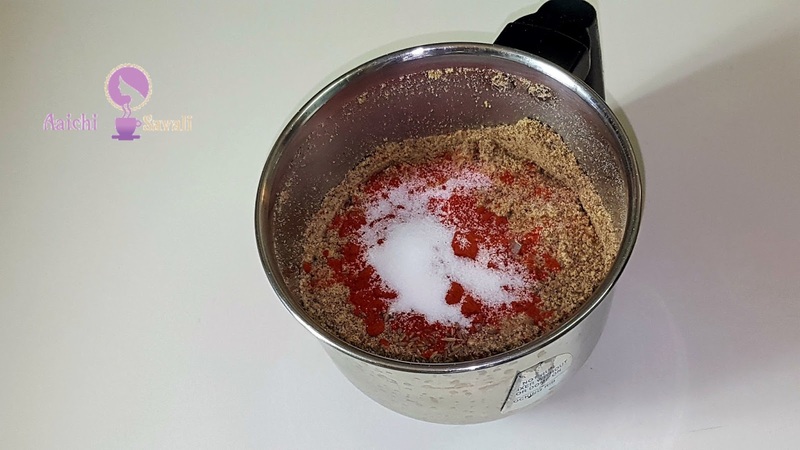 Place dry roasted flax seeds and red chilli powder into grinder and add cumin seeds, salt. Grind it till get coarse paste. Here, healthy, tasty and little bit spicy flax seeds chutney is ready to serve. Take 1 tbsp chutney, make a little well and pour few drops of veg. oil, mix it well and serve it with jowar or bajra bhakri, chapati. It taste awesome. Enjoy !!! 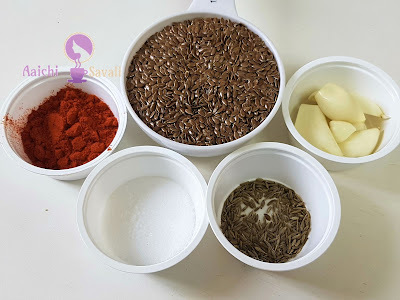 Complete recipe contains - 320 calories, along with carbohydrates - 25.1 g, fats - 22.4 g, proteins - 12.6 g.
Omega-3 fatty acids - Flax seeds are the richest source of a plant-based omega-3 fatty acids, called alpha-linolenic acid (ALA) in the world. Flax seeds is number 1 source of lignin's (antioxidants) in human diets. Weight loss - flax seeds are full of healthy fats and fiber, it will help you to feel satisfied longer so you will eat fewer calories overall which may lead to weight loss. ALA fats also help reduce inflammation. For vegan or vegetarians - flax seeds may also be a good alternative to omega-3 fats in fish for people with a seafood allergy or people those are vegan or vegetarians. Gluten sensitivity - Using flax is a great way to naturally replace gluten-containing grains which are inflammatory where flax is anti-inflammatory. So, flax seeds are great for those who have Celiac disease or have a gluten-sensitivity. Digestion - Flax is very high in soluble and insoluble fiber which can also improve digestive health and is one of the highest magnesium foods in the world. ALA in flax can help protect the lining of the digestive tract and maintain GI health. It is very helpful​ to eat flax to relieve constipation naturally. Skin and Hair health - The ALA fats in flax seeds benefits the skin and hair by providing essential fats as well as b-vitamins which can help reduce dryness and flakiness. It can also improve symptoms of acne, rosacea, and eczema. Cholesterol - The soluble fiber content of flax seeds helps to reduce cholesterol levels naturally.